Our incredible adventure begins in Venice, Jan’s favorite city in Europe. It’s easy to understand the appeal when you picture yourself taking a gondola ride across Venice’s grand canal before having lunch at a canal-side cafe—Prosecco and pizza followed by a cappuccino and tiramisu. On embark day a shuttle will be available from Venice’s VCE airport. The schedule will be provided before airline tickets are available. Unlike normal cruises, our yacht-dimensioned ship will be docked inside Venice’s pedestrian-district, only a short walk (or enchanting Gondola ride) to San Marco Square or Rialto Bridge. We’ll immerse ourselves in Europe’s most romantic city. Not enough time for you? Venice has so much to see that La Belle will stay docked in Venice for a full second day so you can explore to your hearts’ desire. Day 3: Today’s choice of flat rides wander through the Valli di Comaccio, where we’ll spot marshes full of flamingos and fields of olive trees. All routes converge for lunch at a local farm-restaurant which will include hand-made ravioli and other local specialties. This afternoon we’ll explore Ravenna a city with Roman, Gothic, and Byzantine architecture. Day 4: A magnificent day of riding from an idyllic beach town will take us into an entirely different country, San Marino. While we’re cycling the ship will race down the coast and wait for us at our ride’s end. On most days of this tour, our shorter routes will be primarily flat, and longer routes climb into the foothills. On this particular day when most of us will want to get our passport stamped in San Marino, the strong riders will accept the challenge of ascending Monte Titano, while others will take a boost to reach Guita Tower at the peak. That afternoon will be a delightful downhill ride winding through vineyards as we make our way back to the sea. Another great thing about a cycling cruise? The afternoon routes are always downhill! Day 5: One of the rides I am most excited about reaches and explores the renaissance city of Urbino. The entire city is a UNESCO World Heritage Site. Less touristed and far better preserved than Florence, walking the streets of this smaller city gives you an authentic experience of 15th century Italy. 500 years ago, the prestige and opulence of the Palazzo Ducale had the Borgias and Medicis vying for control of the city. We’ll imbibe the stunning landscape of Italy’s Marche region as we ride past charming villages to return to La Belle. We’ll enjoy a day of cycling past scenic beaches where the Italians take their vacations. Rides through expansive nature preserves makes cycling a treat. In Ascolopiceno we’ll marvel at a city founded in 268 BC. The city is an iconic medley of Roman and Gothic architecture. Photographers beware, you’ll want to stop every 10 feet on this day of cycling. Vieste, built on a peninsula, is an incredibly picturesque city on the water, flanked by miles of breathtaking natural parks and renaissance villages. It’s impossible to get lost on this day, there’s always a spectacular view just around the corner. Today’s ride will feature Lecce, a 2,300 year old city that’s a myriad of Roman, Greek, Gothic, and Baroque architecture. We’ll sample a Primitivo (an Italian Zinfandel) at a local vineyard before a peaceful afternoon ride back to Brindisi, a city with miles of wide promenades open to cyclists. Day 10: We will disembark on our final day in Bari, the capital of Puglia which dates back to 300 BC. The city is rich with ancient Roman & Greek architecture, perfect for a few extra days of adventuring if you wish to extend your vacation. After our final farewells, our airport shuttles will take you to Bari’s BRI Airport—the shuttle schedule will be determined before airline tickets are available. We’ve chartered “The Beauty of the Adriatic” for this Venice-to-Bari itinerary, a 110-metre (yacht-dimensioned) vessel with advanced stabilization, ultra-green powerplants and Z-drive propulsion. 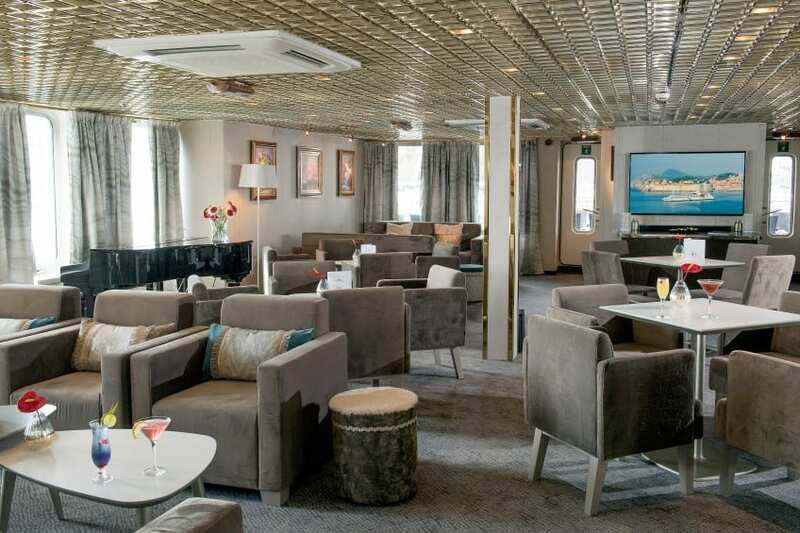 Commissioned by CroisiEurope in 2007, this unique Belgian-flagged cruiser has just fewer than 100 soundproofed staterooms in five categories. All have private bath, spacious floor plans, king-width beds that can covert into separate full-width twins, individually-controlled A/C, and large view windows. The cuisine is exceptional. Breakfast includes bountiful buffets created by our 5-star chef. Each evening your waiter will present a new five course menu—listing an array of choices for you to select from. Is beer & wine included with dinner? Of course! The Lounge has seating for all our guests and is a great place to relax, mingle with your fellow cyclists, catch up on emails, or read a nice book. 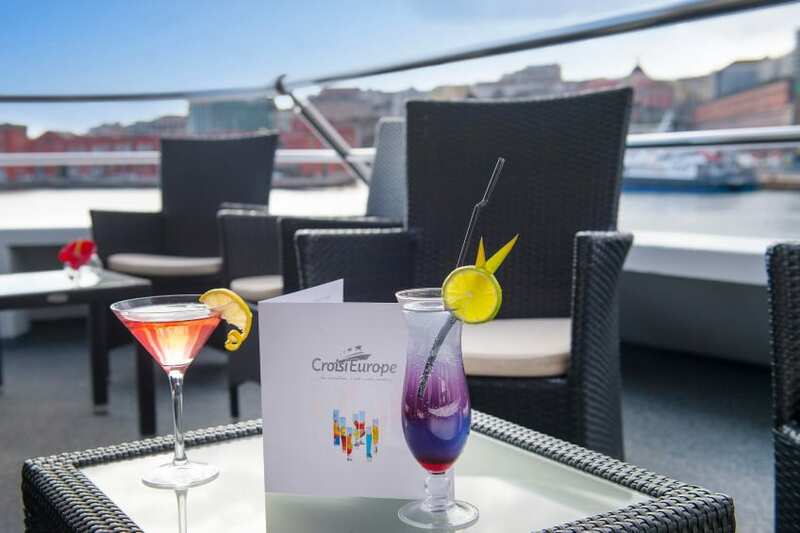 The bar, located on the Sun Deck, enjoys breathtaking 360-degree views. Onboard wi-fi is included, as is expert wash-and-fold laundering of your valuable cycling wear. A: October 17 to 26, 2020. 10-Days/9-Nights. A: Italy is too hot and crowded in the summer. By October the crowds have thinned and the cycling weather is perfect. Mornings in the mid 60s and afternoons in the low 70s. Plus, most of us reach peak cycling fitness in the early fall. A: Due to the current strength of the dollar our first-in per-person pricing for this 10-day cycling cruise starts at $3,699 per-person. Booking early is easy and RISK FREE. 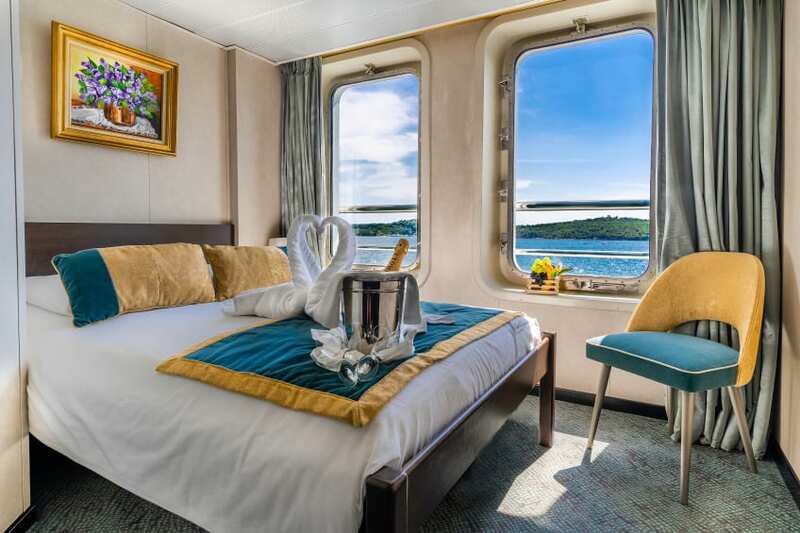 Our reservations page shows pricing of available staterooms. A: Jan and I don’t accept tips. A comprehensive “cruise extras” fee of $400 per person includes a long list of port fees, off-ship activities, admissions, interpretive guides, sight fees, and ride support (gps route files, morning shuttles to give casual riders a head start, and an SOS van driven by a pro mechanic). Note that this is less than the average cruise passenger pays for week of “deluxe excursions.” Shipboard gratuities of $150 per person includes wash & fold laundry and valet bike handling. Q: Are all staterooms the same? 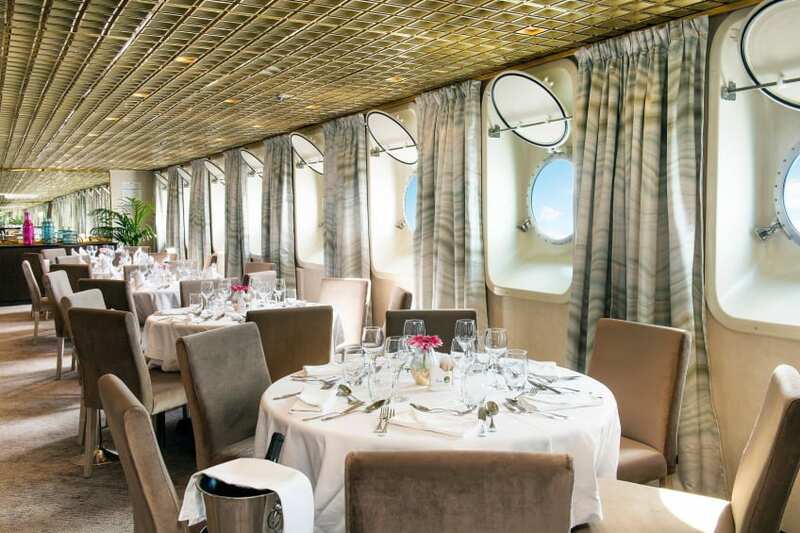 A: The efficiently-scaled La Belle de L’Adriatique has 100 double occupancy staterooms in five categories (sorry, no singles or triples). Launched in 2007 and refurbished in 2017, all rooms in all categories feature exterior view and private bath. 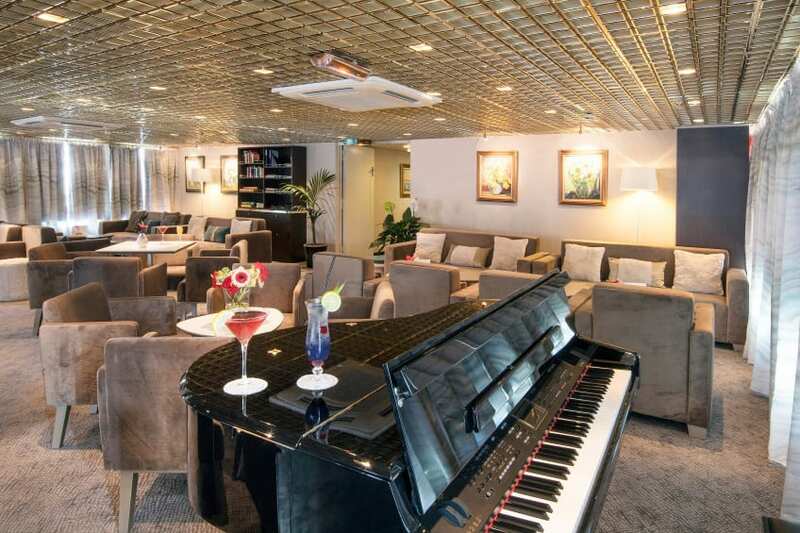 Instead of suites and/or balconies La Belle has large public areas and lots of deck space. Four of the five categories have full-width twins that convert to a king width double. A: Yes. If you own a nice bike that fits, however, bringing it with you is relatively easy and inexpensive. More info on this in Bill’s Travel Tips. Single bike rental rates are about $450 per person for the event, includes delivery to Amsterdam PreTour (or embark) and retrieval from Amsterdam at disembark. A: Detailed info by November ’19. Those who arrive and leave on the embark and debark days will receive FREE Airport transfers. A: In addition to our daily pair of zero-mile options (cruising on the ship or grabbing a seat on our Panoramic-Window coach), every day has multiple cycling routes. Anyone who can ride 40 flat miles will be able to enjoy all eight days of cycling. If you prefer hills or want to ride up to 80 miles a day, we’ve got you covered. At each morning’s breakfast you’ll get a map charting the day’s cycling routes and recommended stops. During a brief route talk you’ll hear about each route’s grades and difficulty. Santana’s vets have learned to love and rely on their handlebar-mounted gps unit. Costing as little as $200, these touch-screen marvels prevent the age-old problem of getting lost or riding unplanned miles. Santana supplies free electronic mapping and route files. Simply select the route and follow the highlighted map. Q: Does La Belle have free WiFi? Does the ship have an elevator? Our comprehensive “cruise extras” fee of $400 per person covers a long list of off-ship activities, port-fees, admissions, and guides. Because cruise ship charters are binding, non-cancelable contracts, Jan and I will only enter into this charter based on your confirmed-with-a-deposit commitment. In effect, we undertake a huge risk by guaranteeing full payment on your behalf. After entering into this obligation, we cannot afford for you to back out, for any reason. This is the same policy that existed on all of Santana’s cruises for the past 9 years.